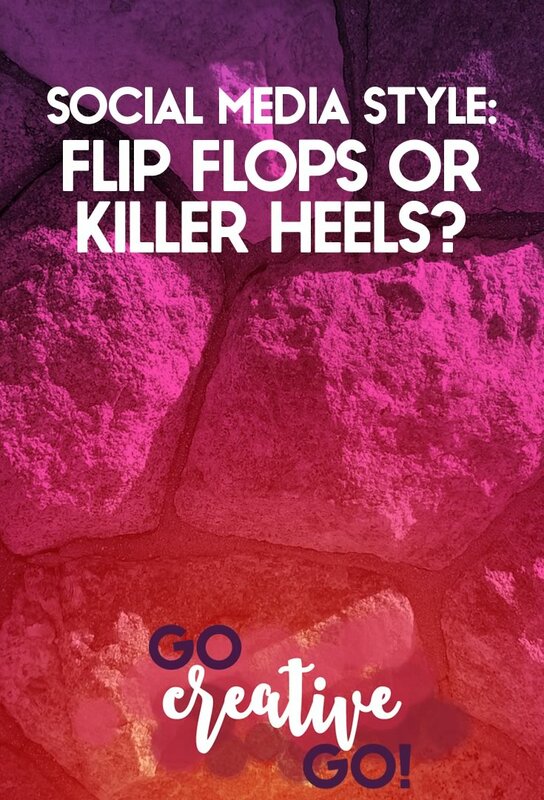 Social Media Style: Flip Flops Or Killer Heels? - Go Creative Go! Social media marketing … there’s no single correct way to market yourself online, no one size fits all solution. As a matter of fact, the success of many a digital marketer gets a serious boost when he or she (and we’re focusing on the gals with the analogy in the title) embraces his or her distinct social media style. If we all liked the exact same things the world would be a very boring place. I’ve said or typed that phrase more times than I can count, yet it’s always relevant and timely. Especially when it comes to your business and brand and the way that brand embraces social media. Sure, there are some fast rules of marketing that have to be remembered when embarking on any digital marketing campaign. But, social media’s humanizing role means your business can showcase and share its true voice, true spirit, true personality and special social media style – and be appreciated for doing so. I tend to keep hammering home the concept that social media is about building a community. You wouldn’t constantly hard sell to members of your local community, say at the summer pool party, would you? Of course not. Why would you think you could do so in an online community? Can you share a quick tip that saves someone time? Can you run a contest with a targeted and tempting prize? Give away something for free? Engage in Q&A sessions? Myth bust? Create an interesting top 10 list? I’m sure you can manage something on that list, right? All are easy ways to allow a little personality to shine through your marketing efforts. Sales alone don’t generate brand recognition. You have to do more than try to sell with your social media. Ever more traditional businesses and industries continue to embrace social media in an effort to humanize their brands and products. Companies engaged in the practice of law, insurance agents, financial planners and more. Yes, these are more traditional industries that can’t shuck certain standards and practices. Sharing smart and savvy information in a timely fashion is a great way to personalize your business. Comfort Is Key To Social Media Style! You have to be comfortable with the style of your sharing if it’s going to work. Your followers, especially those who are considering doing business with you, can sniff out insincerity like days old fish left in the trash. Awful visual (thank goodness monitors don’t have smell-o-vision), but it makes my point. If you’re not comfortable with the style you’re using in your online presence, it probably isn’t really your style. And that pretty much messes up any chance you have of authentically connecting with those with whom you want to do business. It’s got to be real for you and your audience! Whether your favorite footwear is a pair of well worn flip flip flops, a pair of Vans decorated with skulls or an ultra shiny pair of well-heeled pumps…there’s a place for your social media style. As long as that style is truly part of who you as a brand and as a business, it should be something you can maintain and even grow with future social media posts, discussions and other interactions. How Are You Embracing Your Unique Social Media Style? I’d love to know. Is it the tone and language you use on posts and other published content? Is it your image style? What makes you absolutely Y-O-U online?